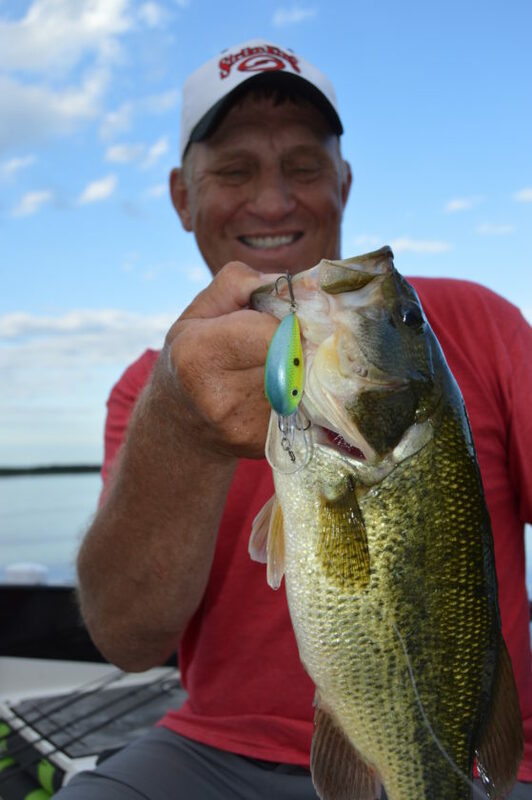 Crankbaits are outstanding for walleyes, pike and bass, year ’round, but especially from early summer into mid-fall. 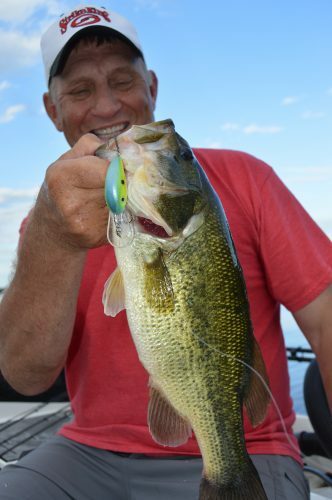 They catch fish along the weedline, over rock piles in the shallow to mid-depths, and pretty much anywhere else where the crankbait can reach the depth where the fish are. If I’m keying on walleyes, I’ll probably be using a Lucky Shad. These are outstanding baits. My favorite colors are Violet Alewife, Chrome Blue, Chartreuse White, and Yellow Perch, although lots of colors will catch walleyes. Lucky Shad are long, thin baits. Spinning tackle works best. 15 pound test P-Line XTCB Braid on a Lew’s Speed Stick in medium heavy 6’6″ or 7′ and a Lew’s Speed Spin or Crush reel will rip through weeds easily and provide a solid hookset. If largemouth are the preferred target, a shorter, fatter bait, something like Strike King’s Pro Model Crankbait in the 4 or 5 size that runs in the 7-10 foot range will be tied on. In the summer, bass, walleyes, and pike along the weedline really like these baits. Bluegill, perch, shad, crawfish, or blue/chartreuse will be go-to colors. We’ll be casting this bait with baitcasting gear: Again, a 6’6″ medium heavy rod in one of the Lew’s Speed Stick Series will be about right much of the time. Team it with a reel that retrieves line at a pretty fast speed. One of the Lew’s BB1 Series will excel. We’ll probably use the same line that we did for walleyes, or maybe go a bit heavier. Make long casts, cover lots of water and catch lots of fish, probably a mixed bag.